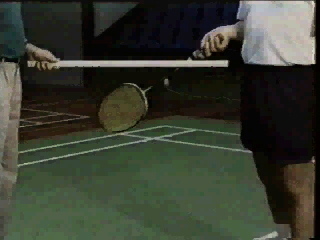 An audio-video presentation of the laws and etiquette of badminton. These videos are designed to give the new player (or non player) a good understanding of the principles involved. For further details and the actual rules see IBF Laws. NOTE: these videos were created with the old pre-rally-scoring system, but the principles explained remain valid. 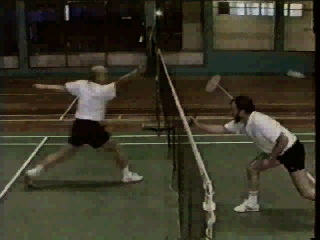 These movie clips are by courtesy of Badminton New Zealand and were digitized by Ken Newman. NOTE: these are large files and will take some time to download! All movies are 160 by 120 pixels with 8 bit mono sound. These files are in Quicktime format. Click here to download a Quicktime player if you do not have one. Starting the Game - 8MB, 2 minutes. Introduction, testing the shuttle, choosing sides. 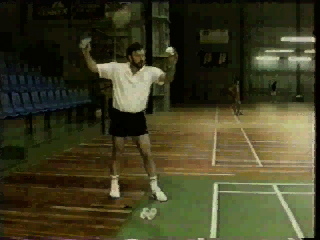 The Serve - 9MB, 2-1/2 minutes. 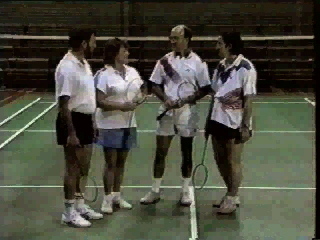 Foot position and motion, delay, racket position, shuttle position. 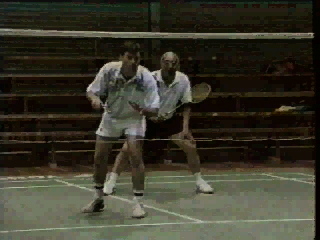 The Doubles Serve - 16MB, 4 minutes. Service court errors for a doubles match. "The side in error cannot profit from being wrong and the side that is correct cannot be penalised for being right." Faults - 6MB, 2 minutes. Point of contact of the shuttle, contact with the net, obstructing your opponent, shuttle caught on the net, bad hits, hitting the ceiling. Lets and General Play - 11MB, 3 minutes. Shuttle stuck on the net, shuttle on the court, receiver not ready, unsighted officials, continuous play. Clothing and Wrap Up - 12MB, 3 minutes. Clothing standards, shirts, shorts, headbands, wristbands, clothing from other sports. If you happen to have the bandwith and space for a larger download, then this same video is available in two pieces, both 320x240 pixels with sound. Much more detail is viewable. Part 1 is 90 MB and Part 2 is 60 MB . While the videos are quite viewable in the above format, which is about the best that is practical on the web at this time, they are much nicer in full video format. Our friends in New Zealand (BNZ Badminton New Zealand) would be glad to sell you a copy.